In 1875, Liberty & Co.'s first small shop opened on Regent Street in London's emergent West End. It grew into a showcase for cosmopolitan goods, and the company became synonymous with exotic and avant-garde design. In particular, Liberty garments were associated with the Aesthetic movement. Arthur Lasenby Liberty (1843-1917), the company's founder, was the son of a small provincial draper. From 1862 his formative business and aesthetic experiences were at Farmer and Rogers' Oriental Warehouse, Regent Street, specializing in fashionable Kashmir shawls and oriental goods. At Liberty's, Middle Eastern and Asian goods determined the character of the store. Sympathetic to Arts and Crafts ideals, which rejected factory production in favor of hand craft and sought to beautify everyday things, Lasenby Liberty's ambition became the reform of dress and home furnishings along "artistic" lines. As an entrepreneur, he found ways of supplying an expanding market with exotic, handmade goods in a retail environment evoking an oriental souk rather than a conventional department store. Liberty's early catalogs, published from 1881, featured silks remarkable for their variety of color, print, and weight. By the 1880s Liberty's name had become a trademark. "Liberty Art Fabrics" were sensuous and subtly colored, widely admired and imitated. Fashionable aniline dyes were rejected in favor of natural colorings; lack of chemical adulteration, antiquity of design, and irregularity of weave, indicating hand production, were also emphasized. Initially, dyed and printed silks were imported from India; later, silks were dyed and hand-printed in England, often by Thomas Wardle. Other companies used by Liberty include G. P. and J. Baker; David Barbour; Arthur H. Lee and Sons; Alexander Morton and Co; Turnbull and Stockdale; and Warner and Sons. Leading designers were used anonymously by Liberty. Textile printing was done increasingly by Edmund Littler at Merton, just upstream from Morris and Co.'s workshops. In 1904 Liberty bought the business; until the 1960s, the emphasis was on hand printing with wooden blocks. Early Liberty textiles were inspired by the Middle East and Asia; by the 1890s, they had a more contemporary look. Although Lasenby Liberty expressed dislike for its more extreme forms, Art Nouveau was dubbed Stile Liberty in Italy. "Oriental" designs continued to sell well in the 1920s and 1930s, when small floral patterns also became associated with Liberty fabrics, which then included a huge variety of natural and synthetic materials. Liberty fabrics were renowned for their softness. Artists appreciated their draping qualities, and Liberty's early dress designs exploited this tendency to follow the contours of the body. This could be perceived as a challenge to propriety, particularly when used in at-home garments such as the tea gown, pioneered by Liberty and others. Early catalogs are illustrated with vignettes of women in exotic or classical costumes. Some assistants in the shop wore unusual dress; even in the 1930s, shopwalkers wore medievally inspired velvet gowns. Liberty's "artistic" styles were imitated and caricatured, notably by the cartoonist George du Maurier. A Costume Department was established in 1884 to design and make garments suited to the fabrics; eclecticism predominated over fashionable dress. It reflected Lasenby Liberty's determination to control the entire process of design, production, and retailing. The architect E. W. Godwin was consultant designer until his death in 1886. While his earlier designs were notably Japoniste, classical models and the principles of dress reform inspired Godwin's later ideas about dress. Liberty resisted the dominance of Paris-led styles, although a successful branch was maintained there from 1890 to 1932. Instead, the company pioneered the unstructured cut of Asian clothing as a means of liberating women from their corsets. 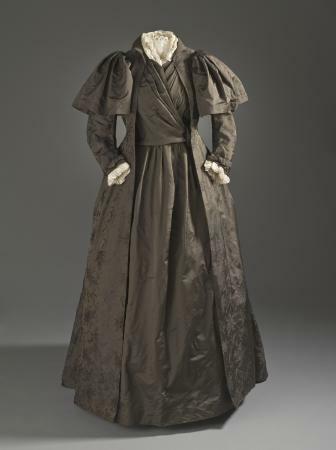 Tokado was described in the company's 1884 catalog as a "Japanese robe arranged as a tea gown." Other popular garments included the burnous cloak, derived from North Africa, and the Greek-inspired tea gown (Hera, 1901-1909) was an example of Liberty's attempt to promote classical "Greek" dress well after Godwin's death. As fashion absorbed dress-reform principles, Liberty designs appeared less eccentric. By 1925, a "kimono" style floral-print coat, reminiscent of designs by the French couturier Paul Poiret, appeared highly fashionable. Poiret even used Liberty fabrics in his couture business and, following its demise, designed four collections for Liberty in the 1930s. From the 1880s, Liberty also promoted "Artistic Dress for Children," inspired by the drawings of Kate Greenaway; the "Liberty Smock" was a notable example. Liberty also developed a reputation for furnishing fabrics, curtains, bedspreads, and upholstery. A furniture department, supported by its own workshops, opened in 1880 under the direction of Leonard F. Wyburd. At first Liberty imported goods from countries seen as "exotic" and pre-industrial, producing handmade, but relatively inexpensive, furniture and artifacts. Lasenby Liberty traveled widely, notably to Japan, to observe their production firsthand. Shrewd business instincts drove him to innovate however, and he had no scruples about modifying designs for the home market, developing hybrid, Anglo-oriental artifacts and other ersatz styles, incorporating Arts and Crafts, "Celtic," "Tudor," Art Nouveau, and oriental elements. He also invested substantially in small companies producing ceramics, metalwork, and jewelry. During the 1920s and 1930s, Liberty goods changed little, although after both World Wars, traditional, "English" values were favored. In the 1950s and early 1960s, the company redefined itself as contemporary and European, commissioning work from world-class designers. From 1962, Bernard Nevill directed a new era of distinguished textile design; dress reflected the exuberance of the fabrics. When "ethnic" and revivalist styles became fashionable in the late 1960s and 1970s, Liberty acknowledged the exotic and Art Nouveau heritage it had earlier rejected. The company remained in family ownership until 2000. Subsequently, the store was modernized, and fabrics and oriental goods became less prominent, while greater emphasis was placed on luxury accessories, furnishing, and "idiosyncratic" fashion by international designers. Adburgham, Alison. Liberty's: A Biography of a Shop. London: Allen and Unwin, 1975. Commissioned by the company for its centenary. Ashmore, Sonia. "Liberty's Orient: Taste and Trade in the Decorative Arts in Late Victorian and Edwardian Britain, 1875-1914." Ph.D. diss., The London Institute/The Open University, 2001. Calloway, Stephen, ed. The House of Liberty: Masters of Style and Decoration. London: Thames and Hudson, 1992. Morris, Barbara. Liberty Design: 1874-1914. London: Pyramid Books, 1989. Okabe, Masayuki et al., eds. The Liberty Style. Tokyo: Japan Art and Culture Association, 1999. Victoria and Albert Museum. Liberty's 1875-1975. London: V & A Publications, 1975. Exhibition catalog.